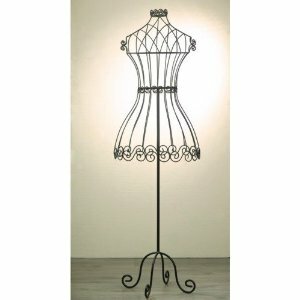 I am currently obsessed with wire mannequins. It started innocently enough. 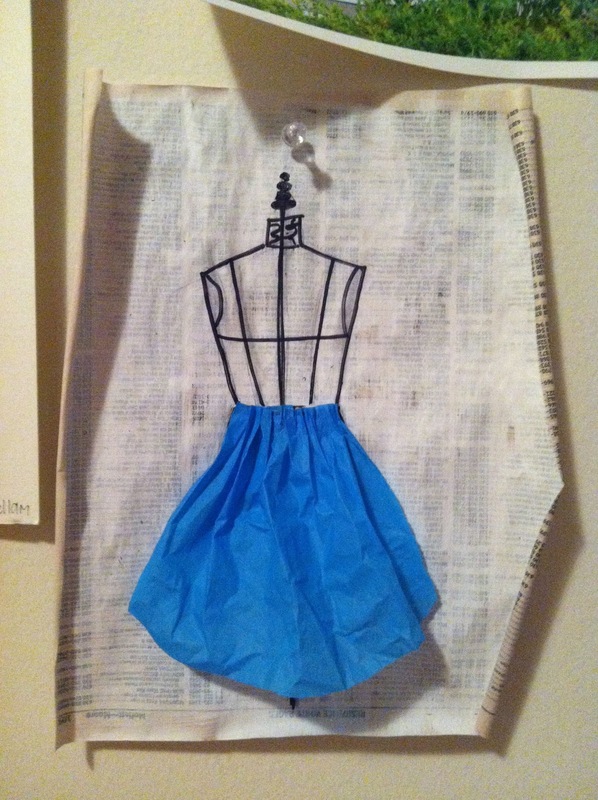 I saw a cloth covered mannequin at Hobby Lobby and thought it would be fun to cover it in book pages and then hang tons of jewelry on it. Unfortunately I have no room for such a large decorative object so I resisted the urge to buy it. 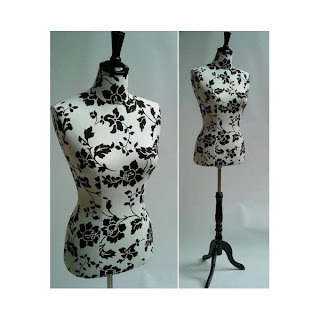 I still think about that mannequin and all the artistic things I could do to it. Then my daughter got a tattoo on her back of a wire mannequin. It is beautiful, like nothing I have ever seen before. That sent my obsession into high gear. Now I want to use the mannequin shape in all kinds of artwork. Here we go. . . 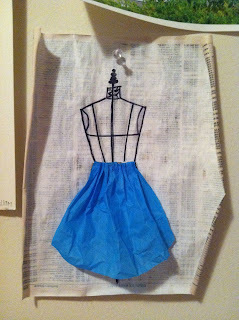 The beginning of my mannequin art. 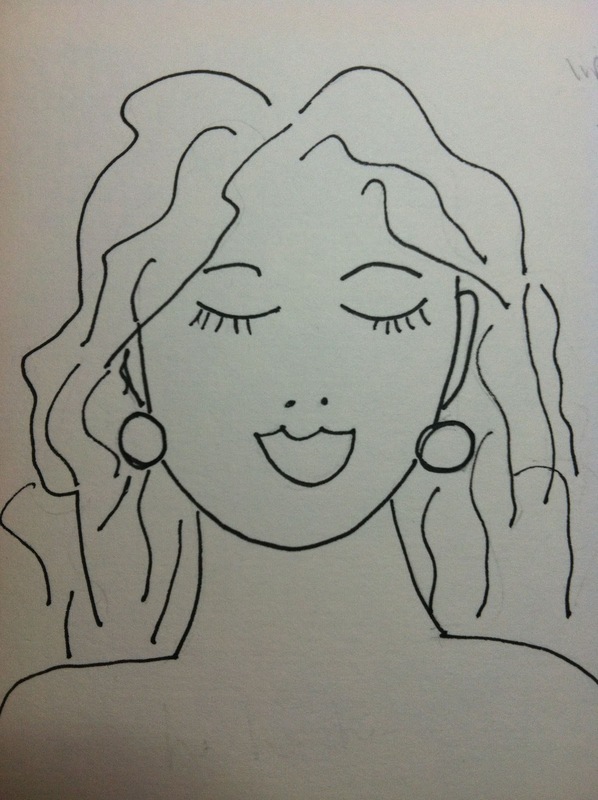 A few months ago I bought the DVD All About Faces with Julie Fei-Fan Balzer. 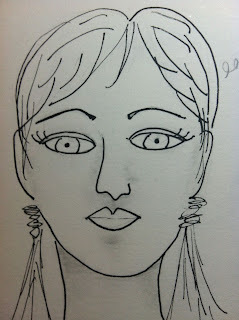 She teaches the correct proportions for drawing a pleasing face and also shading techniques. 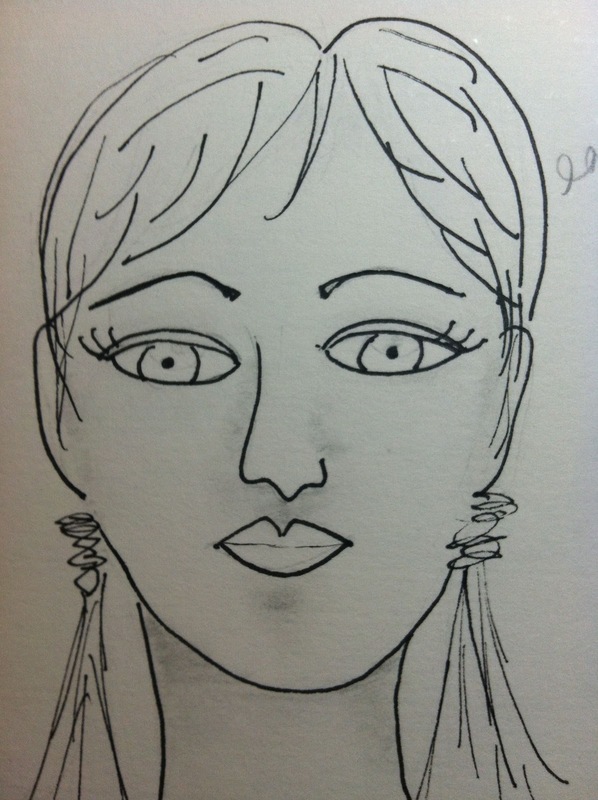 Luckily she also has suggestions for different ways to draw eyes and noses. 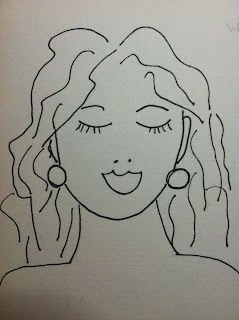 Here are some of my drawings. proper placement of all the facial features. I added shading on my second drawing. 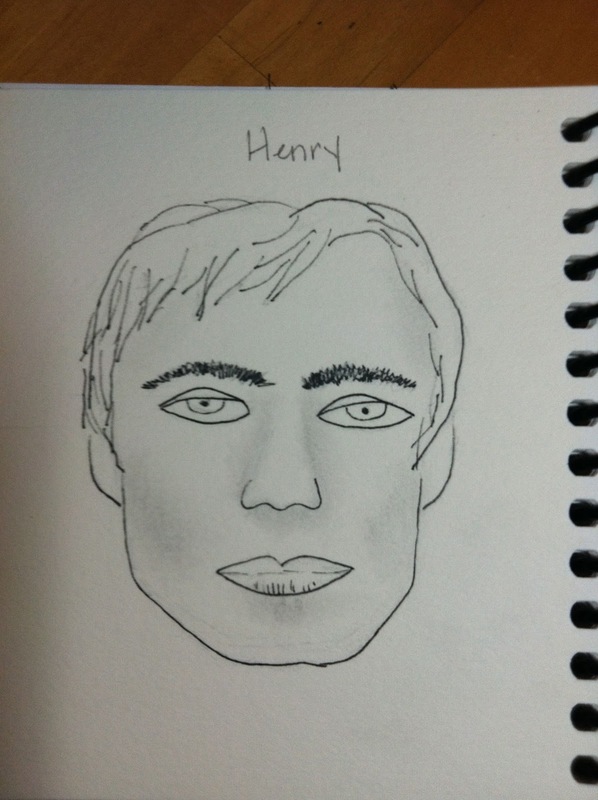 My first attempt at drawing a man. 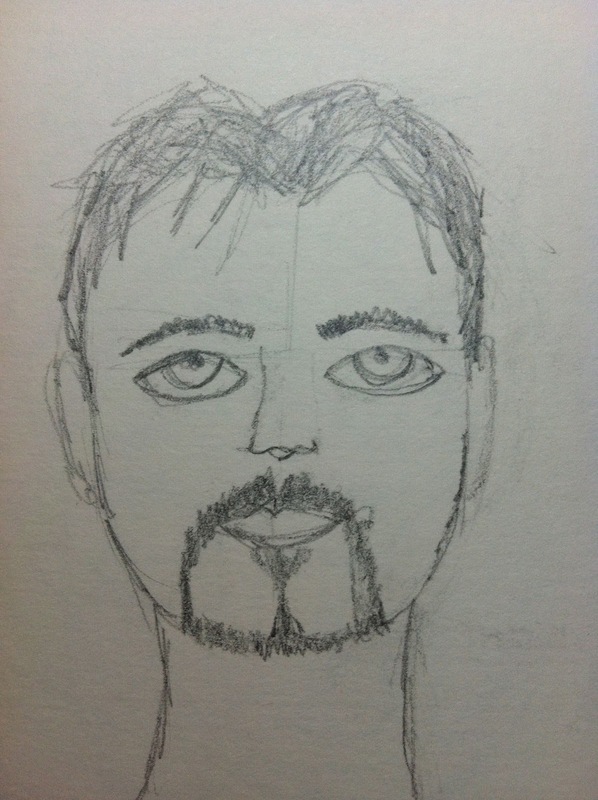 I added the goatee so that it was obviously male. 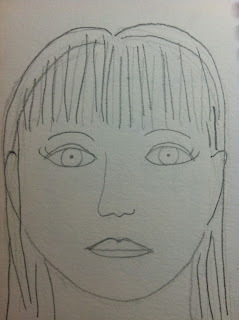 Recently I watched a collage video by Jenny Cochran Lee in which she talked about drawing faces in her art. 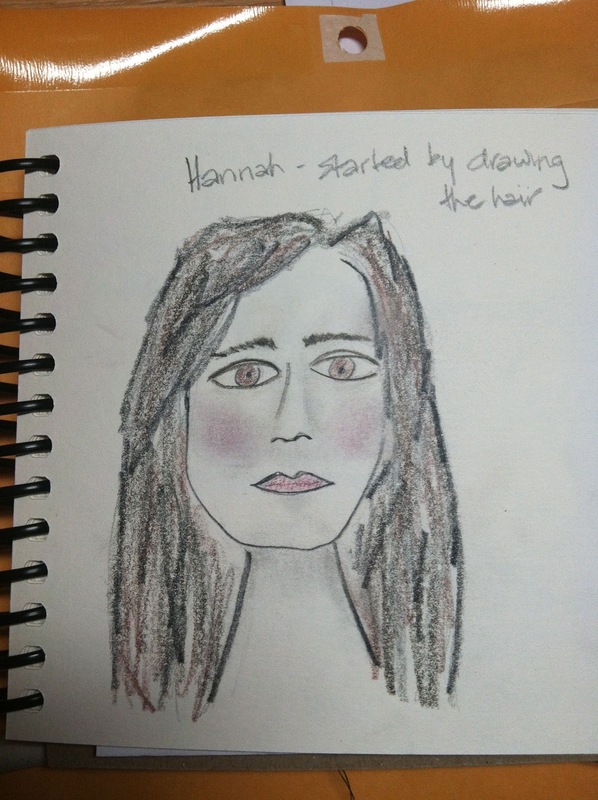 She starts with the hair rather than the oval face. That seemed like a good idea so I tried her technique as well. 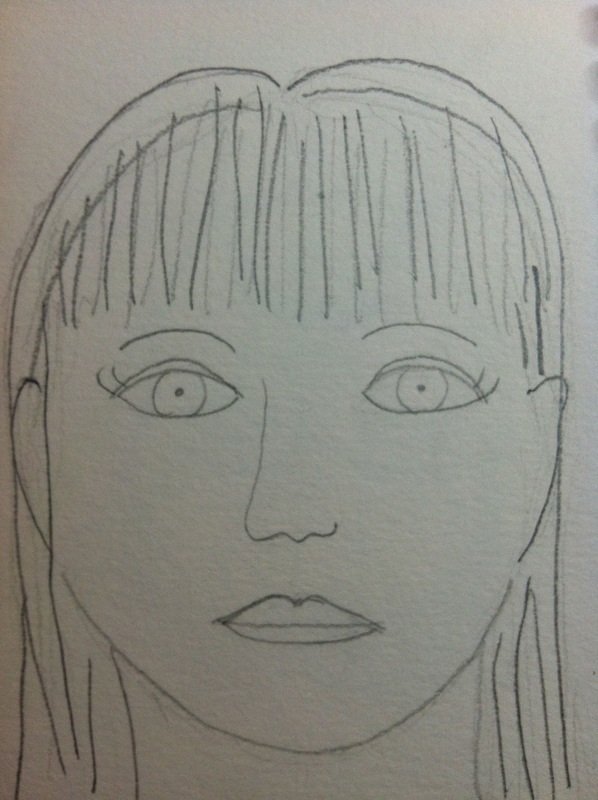 Now that I understand the proportions and the placement, I want to work on making the faces look happy (mine are extremely serious). Then I want to use more color for the shading. I have lots of practice ahead of me, but my goal is not portraiture. I want to be able to add faces to my artwork - some fun and silly, others a little more realistic. I will need to learn how to draw a slightly turned face as well. The proportions are different when at an angle. So much left to learn! And according to Malcolm Gladwell, 10,000 hours of practice are ahead of me. I had an art play date with a friend who is a self-proclaimed Pinterest addict. 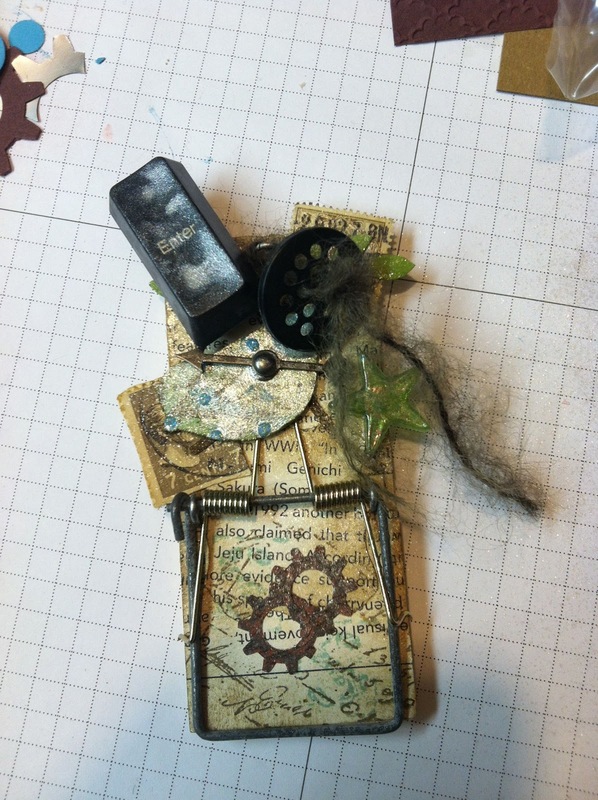 She chose the project from her vast collection of ideas within her Pinterest boards. 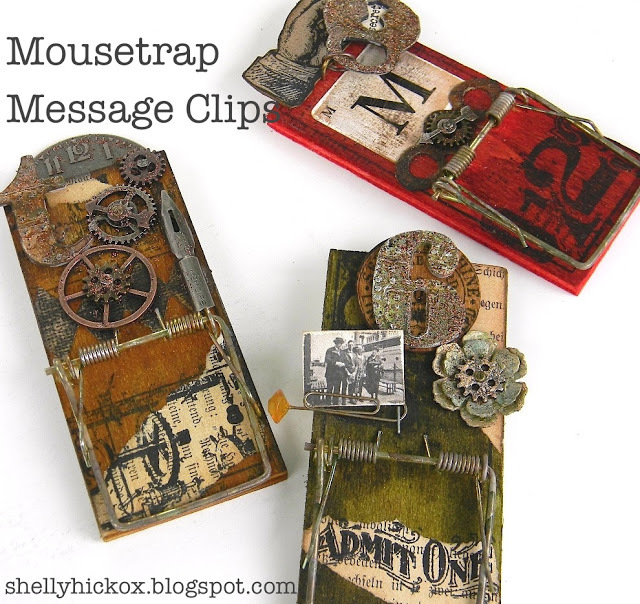 She chose a steampunk message clip made from a mouse trap. 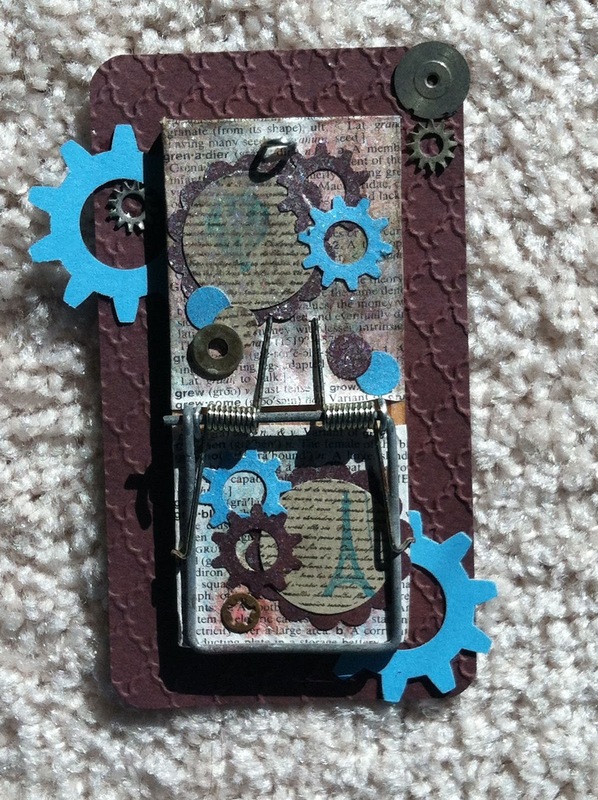 Steampunk is not a style I work with very much but I gave it a shot. At first I used the color red on my mouse trap but quickly realized that it looked like mouse blood (yuck!). I changed to brown and ended up with turquoise as well, a color combination that I find myself returning to again and again. Now I have to figure out where to hang my message clip. By the front door? On the refrigerator? Next to the spot on the counter where I always put my purse? Decisions, decisions. 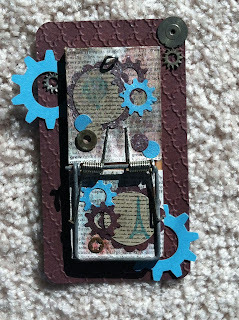 My BFF (whose creativity I greatly admire) has generously contributed a guest post describing how she makes these adorable journals from a decorative letter sized file folder. I was going to an art conference and needed a something to take notes in. A store bought journal would have sufficed, but NOOOOO, I had the knowledge and time (okay maybe not the time) but I could make my own! And then I spied my assortment of funky, beautiful file folders that I had collected stuffed amongst my collection of maps, tissue paper and colorful plastic bags. You know the shelf I am talking about – everyone has one! To begin, I cut some 90 lb. paper to create 4 signatures. I wanted my completed journal to be something that could easily fit into a purse or bag. I used 11x14 inch sheets of Bristol, torn in half so that each piece of paper was 11 x 7 inches. These were folded in half lengthwise. Four pages were stacked together to make a single signature, 5.5 inches wide and 7 inches tall. The file folder became the cover of my journal. I used the size of the signature to determine where to fold and glue the file folder. Using the main fold of the letter sized file folder as one side of the spine, I measured 1/2 inch away and folded along this line to create the other side of the spine. I measured 1 inch from the top and folded the top edge down to the inside of the folder. Using the signature to determine the required height of the cover, I folded the remaining bottom edge up to the inside of the folder. Finally I cut out some wedges where the folder was double thickness along a fold, such as the top and bottom of the spine. This reduced the bulk and gave the file folder a little more "give." When gluing the bottom fold up, I only glued along the spine and the edge in order to leave a pocket on the front and back cover. Once all the edges were glued in place, I pamphlet stitched the signatures into the spine and added a Velcro tab for the closure. I also thought that this would be as much fun (if not more) to decorate a file folder myself. So I took a plain manila file folder (letter size, these were all letter size) and collaged some papers and tissue on, then stenciled a bit and finished with a wash of color. I am definitely going to do some more of these! These are addictive. I made a batch of 8 so that I could share with friends!